Well … I did not actually pick the lock. 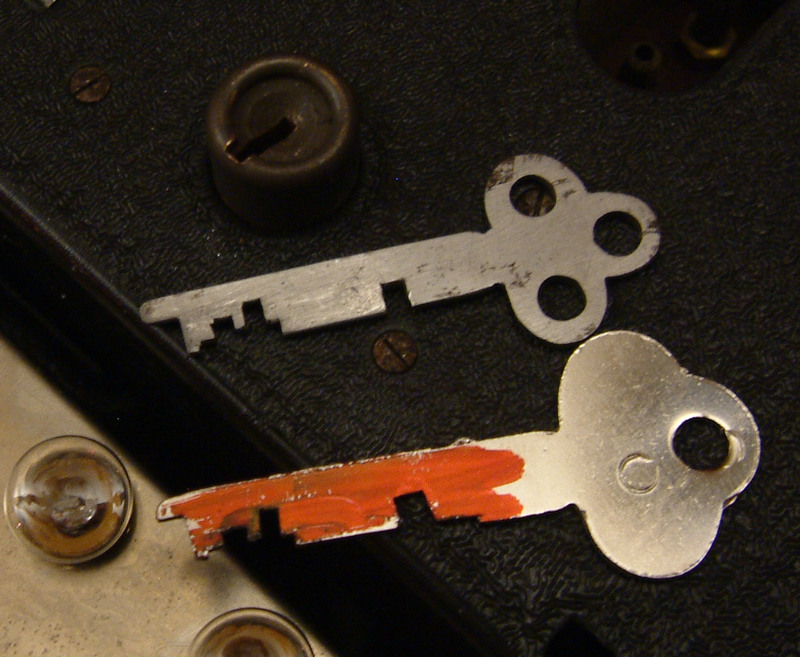 I used simplified impressioning to create a working key. The nice thing about Toool is that it attracts interesting people. Some of these people come to learn about locks and lockpicking, others come with interesting lock related problems. Last Tuesday’s Toool Eindhoven meeting was no exception. It was the day someone (who wants to remain anonymous) brought an Enigma machine and wanted me to make a proper key for it. 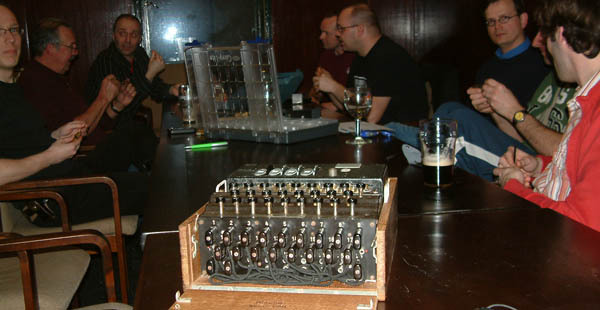 For those unfamiliar with the enigma: it’s a (by now) famous encryption device used by the Germans during World War II (wikipedia). It is pretty rare device, and the most common place to find one is in a special museum or in history books. Yet someone brought one to a Toool meeting and gave us all the opportunity to have a close look. The reason the machine was brought to Toool was because the key was missing. The only thing the owner did have was a key from a different machine that worked on the lock once. 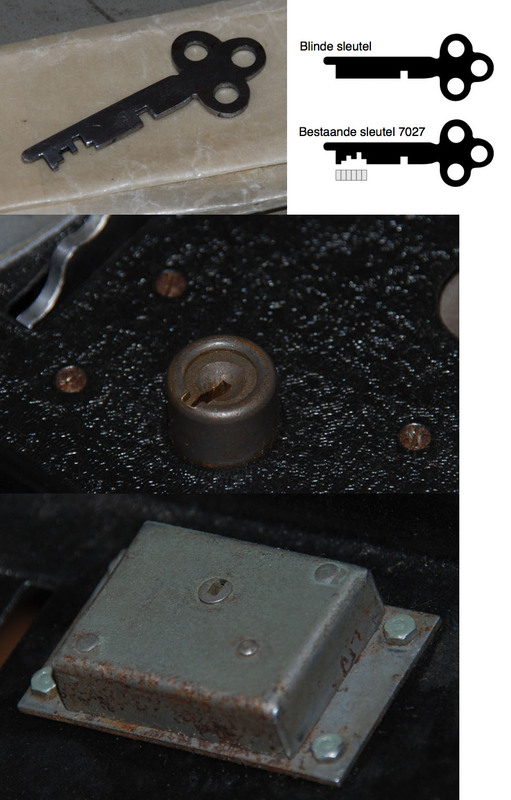 Under normal conditions I would just remove the lock and examine the levers to cut/file a proper key. However, at this device all screws were still sealed with a special kind of paint. The owner of the box was real keen on keeping this seal intact, and I can’t blame him for that. 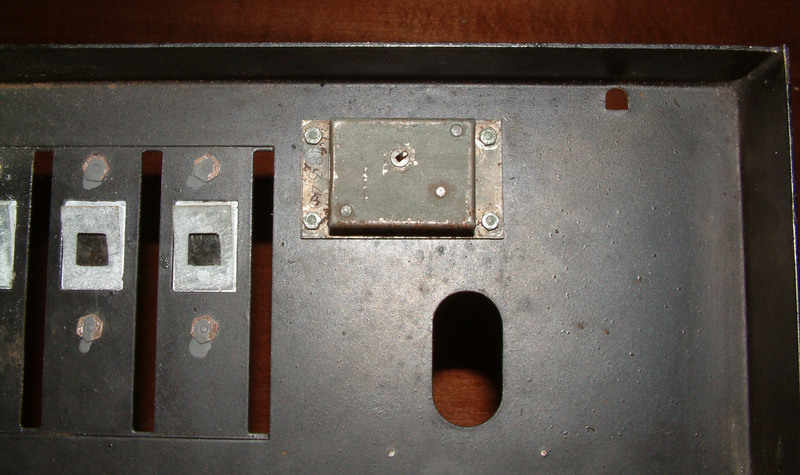 One other security feature that caught my eye was that the lock had the serial number of the device stamped in the housing. My approach to make a key was relatively simple. I knew from emailing with the owner what type of key to expect, and came prepared with a range of blank keys. 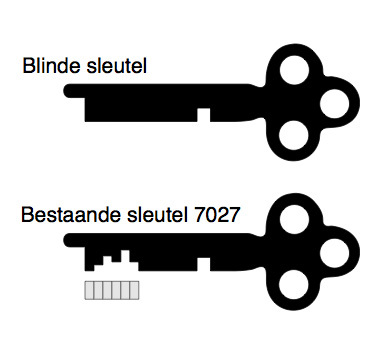 At the club I filed one of the blanks down to same hight as the key he brought with him, except on my key all cuts were about one millimeter higher. 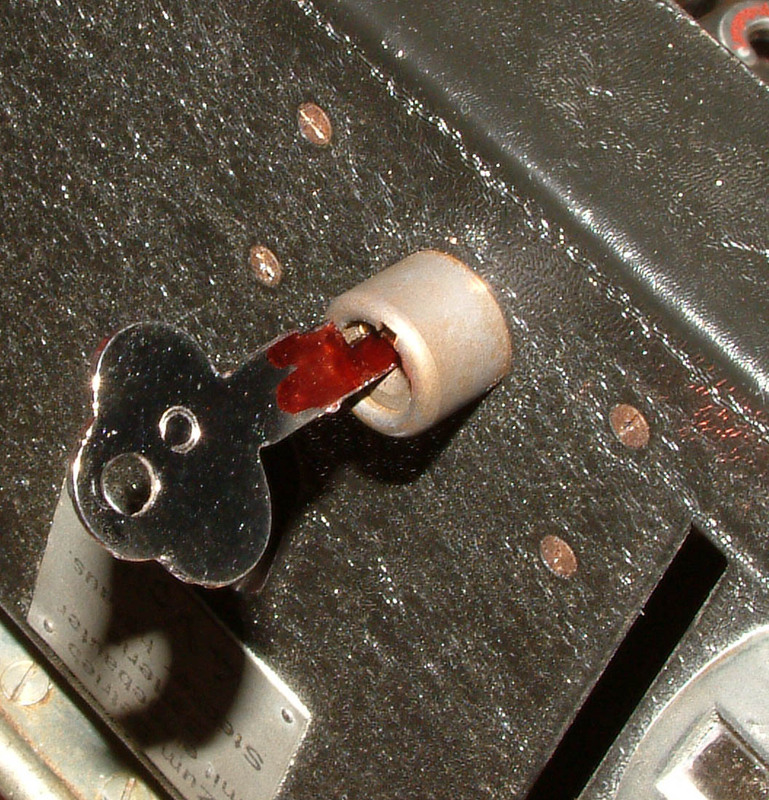 After filing this key, I used a marker to ‘paint’ the surface of the key red. When the ink dried, I inserted the key into the lock and gently tried to turn it. It did not rotate all the way, but already opened the lock! Looking at the key I found that the ink was scratched on two positions. Filing down these two positions a little made the key fully turn and operate the lock. Still one more round of filing was needed to make the lock operate smoothly. Maybe under normal circumstances no big deal, but the uniqueness of this device made it very memorable for me! And I sure was happy and relieved it went so smoothly. Of course we had many questions for the owner of this device. The main question was where he got it, and how he managed to get it. His answer sounded somewhat familiar: By writing on the internet about various encryption devices, and publishing about reverse engineering some of them, he became a known source of interesting and rare information. And because of his high google ratings on scrambling devices, he came in touch with lots of other people who share the same interest. Someone who owned an enigma machine contacted him because of these publications, and offered it for sale. The rest is history…. This approach shows interesting similarities with how we run Toool. We too benefit from the fact people know to find us because of our various publications and known expertise. Of course we wanted to know if other kind of locks were known, and we learned only Naval Enigma machines were equipped with locks. The standard naval ‘three wheel’ device even had two locks. The one brought to Toool was a special ‘four wheel’ enigma used in submarines. This entry was posted on Sunday, April 6th, 2008 at 22:11 and is filed under Uncategorized. You can follow any responses to this entry through the RSS 2.0 feed. You can leave a response, or trackback from your own site. I hope you had fun with the Enigma. Not too many people get to play with one of these anymore. They are fascinating pieces of work. I am fully aware of the uniqueness of this little project. It’s these kind of events that give me the energy to keep on investing so much time and effort in this hobby. congratulations Barry!! This was very interesting. And the fact that you impressioned a key for one of the best kept secrets of WWII. And FYI, Enigma was one of the worst kept secrets EVER in warfare. God bless the Polish. I used the enigma from http://users.telenet.be/d.rijmenants/ on a windows emulator for Mac. Can you verify the settings once more please? I must agree with Barry, re Jean-Claude’s enigma message – I’m pretty familiar with machine setup, certainly took right wheels (C reflector, gamma, VII, III, V, no plugs). Tried TOOL on the wheels, tried playing with the wheel-offsets, but all I got was random letters. I was using the same simulator as Barry, and it claims to be and is regarded as a totally accurate simulation. Okay, mystery solved (well, sort of.) As far as I can tell, the accuracy of the simulators seems to be a matter of contention. Some sites state that CGS simulators are the most accurate. That version can be found here, and is the simulator I used. Other sites claim Dirk’s simulator is the most accurate. That version can be found here. As I am on a PowerPC Mac, I only have limited access to Windows machines, but I will compare the output of both as soon as I can. That being said, I stumbled across a cross-platform Java applet that has some settings that were not in either of the previous simulators, most notably extra settings for the thin B and C rotors on the M4. That version can be found here. Great, now I have different versions and wiring of the thin rotors. I fear some rotors may have been lost to the sea, or time. I need to see some real rotors, is all. 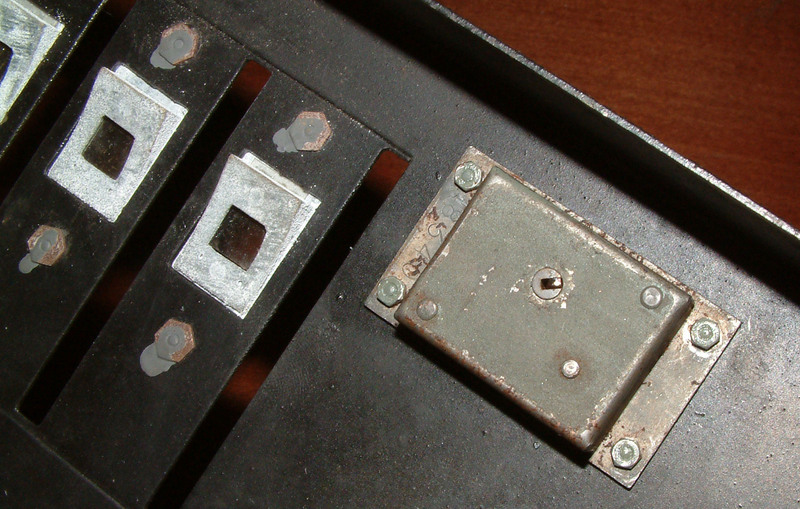 One thing I do like, in the assembly of physical locking mechanisms, is the idea of a reflector, in code, or a secondary locking mechanism, that is independent of the bolt. Well, this was disappointing. Some simulators are truer to form than others, but they all suffer from defects, given time and input. This affects the four rotor version the most, since it was one of the rarest. Unfortunately, I do not have time to overhaul the existing code, so I’ll do it from scratch, using only known, verified rotors, wiring, and logic. Also, since existing three rotor code is pretty well vetted, I’ll go after the three rotor project last. Since TOOOL has varying operating systems, I was thinking Java. This would allow for cross-platform development for other variants, without too much modification. Barry: To be honest, I like emulators, not simulators. Anyways, it’s an interesting side project. I just like it to work. to end the discussion on the accuracy of the enigma sims, both the CSG sims and the sims on my website are accurate and tested to real machines. Before adressing the problem, one important thing. One what machine (or sim) was the discussed message encryption? 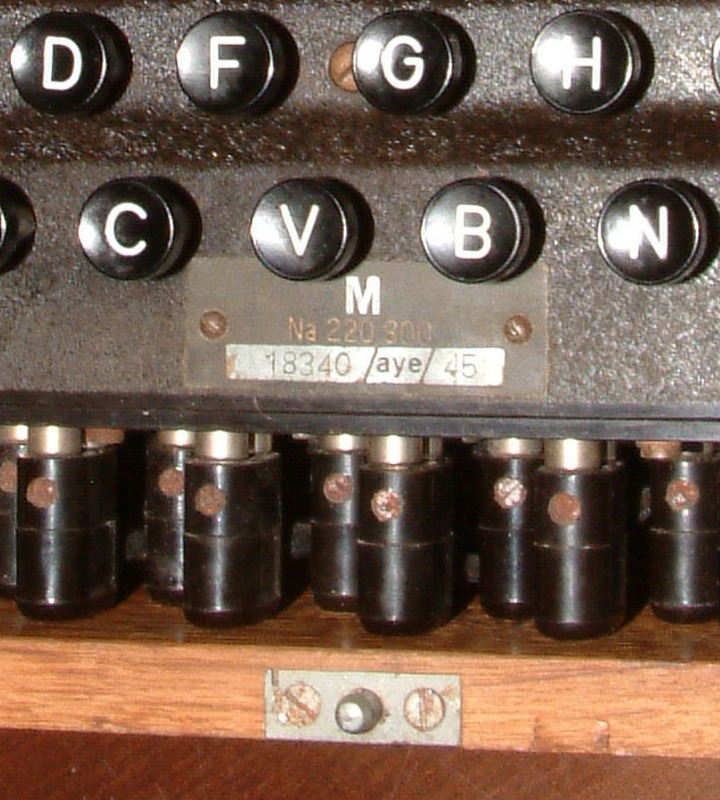 If it was on a real machine, be aware that after the ware many of the enigma rotors were rewired (mostly in norway) and ended up in the selling circuit (for lots of money) and are NOT original. Have encountered this problem personally. There are two possible explenations for the decrption problems. Fist one occurs most often: operator error, that is wrong settings, startposition of the wheels, ringsettings (important) and type of rotors. Especially the ringsettings or ringstellung is often forgotten. Second possibility is the inacuracy of the simulations or the machine. Both CSG and my sims are wired identically to the authentic machines and fully compatible. Also and Carlsons enigma applet works correctly. For wrongly wired real rotors, see above. 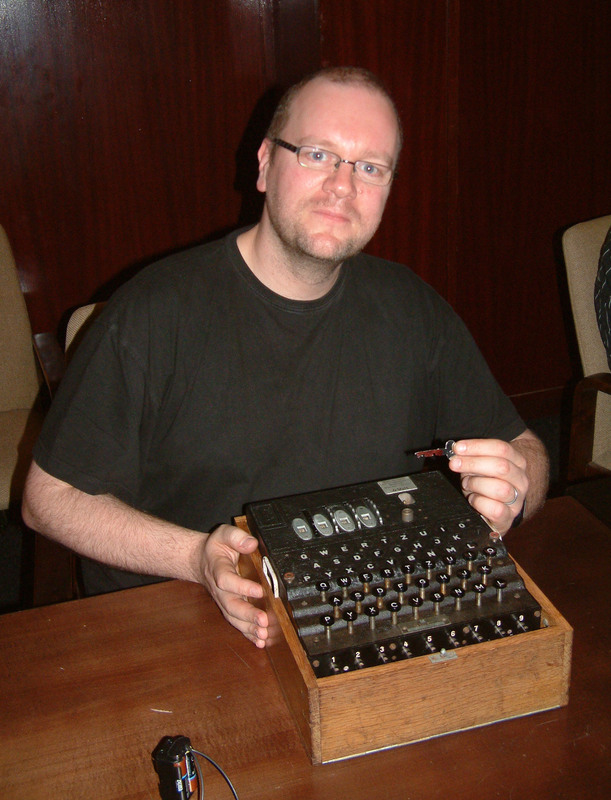 If anybody knows of an Enigma for sale, let me know. I want one now. Barry: Have a great time, Austria is just sick. If you have between $20,000 and $30,000 I might fancy some contacts for you sell a machine. E-mail me directly, or through my website. Is it still possible to get hold of one of this type of lock? 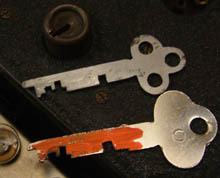 The modern za type locks (at least those manufactured and on sale in Britain) are different. As some one working on a long term m4 rebuild, any leads on one of the type used on the m4 would be greatly appreciated.. Entries (RSS) and Comments (RSS). 61 queries. 0.501 seconds.